The Insights page allows you to develop a better understanding of your visitor segments. From your back-office, click on “Audiences” in the side menu, then “Insights”. Feel free to read our article on the structure of the Insights page. The Insights page offers you to develop a better understanding of your visitor segments. To learn how to access it, please read this article. The header, which presents the possible actions on the page, the filters, the selected date range and the concerned website(s). The key information, which brings together the most important data on the website and its performance. The audience segmentation graph, which ranks segments based on their performance. The audience segmentation table, which details the data by segment and can be set according to your preferences. From your personal space, click on “Hearings” in the side menu and then on “Insights”. To learn more about the structure of the Insights page, please read our article on the subject. With Kameleoon, you are able to identify, regardless of any experiment, which of your segments can significantly increase your ROI. It records data related to your segments, over a period of up to two months, and displays them to help you in your decision making. From these segments and data, you can create personalizations, as close as possible to the behaviors and expectations of your audience. Those who fulfill a targeting condition. 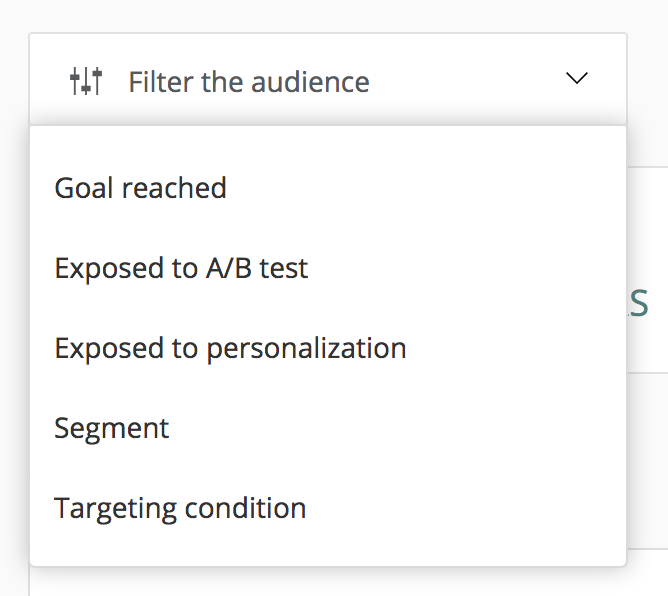 Click on one of these filters, then check the item(s) that interest(s) you: goal(s); A/B test and variation(s); personalizations and variation(s); segment(s); targeting condition(s). You can reset these filtering criteria by simply clicking “Reset”. By default, the audience analysis displayed on the page corresponds to the traffic of the day before. You can change this setting to display Audiences results for the last week, the last two weeks, or the last month. 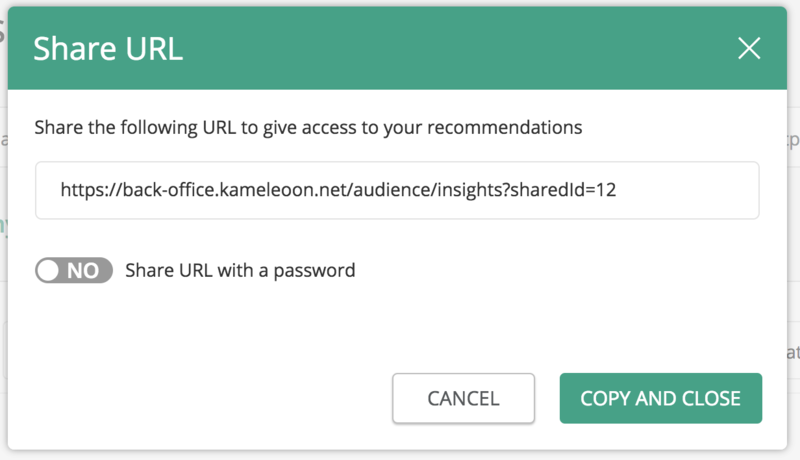 If you have installed Kameleoon on multiple websites, you can navigate through their audiences via the dropdown menu at the top right of the page. 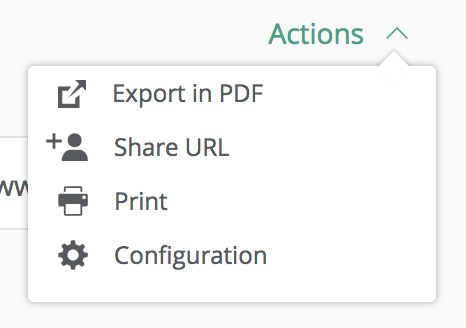 In one click, the analysis of your audience can be exported as a PDF file. You can also share the URL of the page to give your employees access to your recommendations. A switch YES/NO button allows you to share this URL with a password: access to this page from the shared link will be secure. Set the password by entering it in the text block. By clicking “Copy and close”, the URL is automatically copied to the clipboard. The page thus shared only allows consultation and does not give access to the editing options or the various actions. The page will be printed as it appears in a PDF export. This action redirects you to the configuration page of your website. In the “Audiences” tab of this page, you can modify related parameters. This will of course have an impact on the segments that you will be offered in Audiences. In “General” you can change the primary goal as well as the conversion value linked to it. Enabling the “Ignore the settings in the URL of your pages” option will treat all your subdomains as one primary domain. 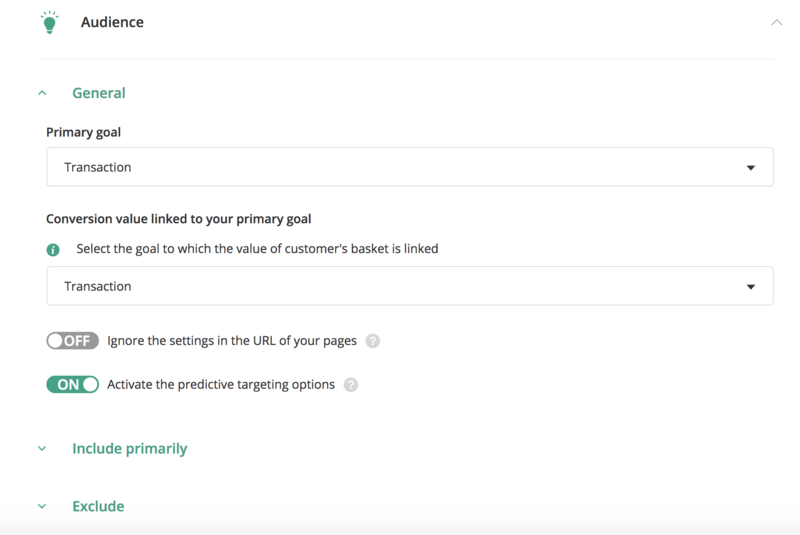 “Activate predictive targeting options” allows you to launch machine learning to automatically analyze all available data in real time, so you can target visitors based on their likelihood of converting a goal. As well as the URLs that you want to optimize in priority. Average conversion rate among these visitors. The x-axis indicates the names of the different segments. On the x-axis are identified the different segments. 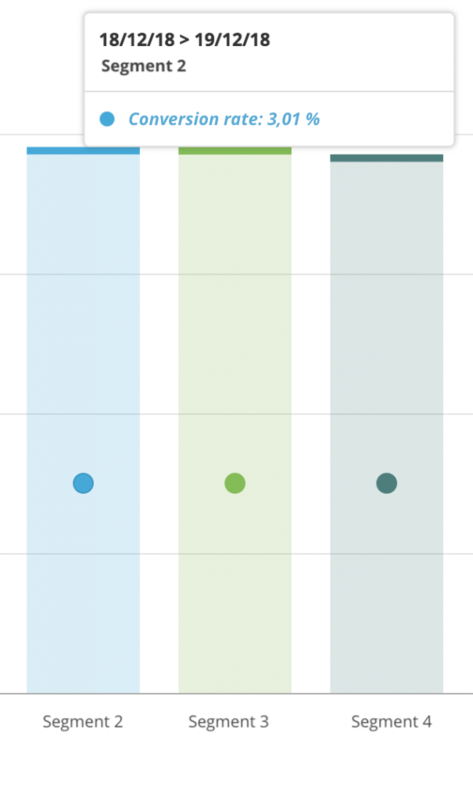 On the y-axis you will find on the left the size of the segment (number of visitors) and on the right the conversion rate of each segment. The main y-axis allows you to estimate the size of a segment. For more precision, hover your mouse over the rectangle of the segment: the precise number of visitors included in the segment appears. 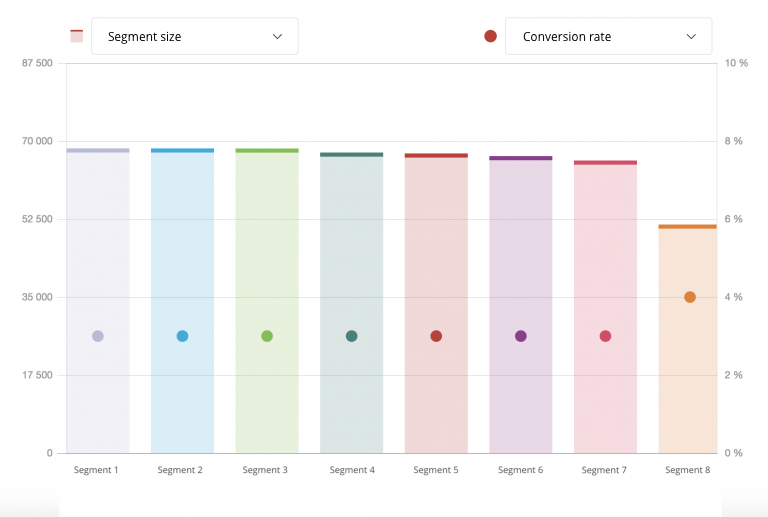 The secondary y-axis allows you to estimate the average conversion rate for a segment. 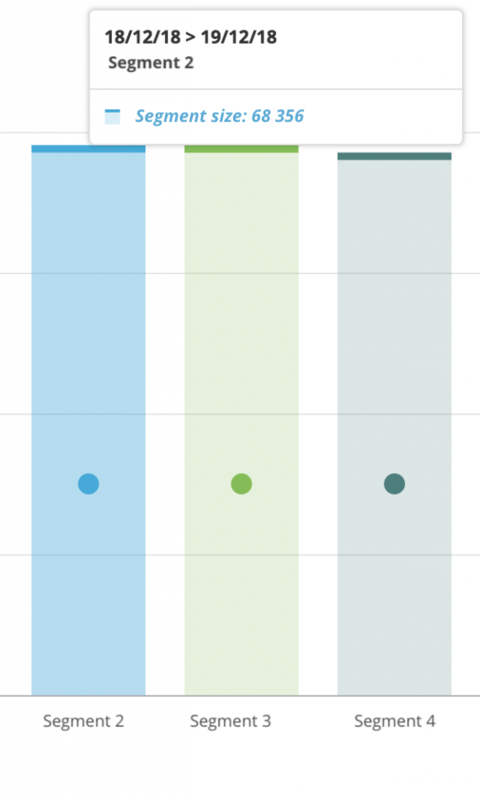 To see the exact rate, hover your mouse over the circle on each colored rectangle: the data appears. Click on the ON/OFF button to find your favorite segments. The behavior of the diagram is then the same as that of the rest of the segmentation: the size of the segment is represented by a colored rectangle, the conversion rate by a circle, and when hovering over each of these elements you can consult precisely the associated data. Note: The button only appears if you have added at least one segment to your favorites. By clicking on the dropdown menus just above the graph, you access the parameters of the graph and can modify the criteria of the ordinates axes. Note: You also have the option of not exploiting the secondary axis. To do this, simply choose “None” in the graph settings. Under the histogram is a table that also shows the segmentation of the audience. Each “bar” of the histogram corresponds to one line of the table and there is, beside the name of each segment, a little circle of the same color, which allows to identify them even more easily. By default, the first 8 segments – those that affect most of your audience – are displayed. The ones Audiences created for you. Above the table is the selected period. To modify it, pull down the drop-down menu “Period” located at the top of the page: the table is automatically updated. The first line of the table is dedicated to the selected audience (here, all visitors) and related data: the segment’s size (here, 100% since the audience consists of all visitors), the conversion rate and the gain generated. 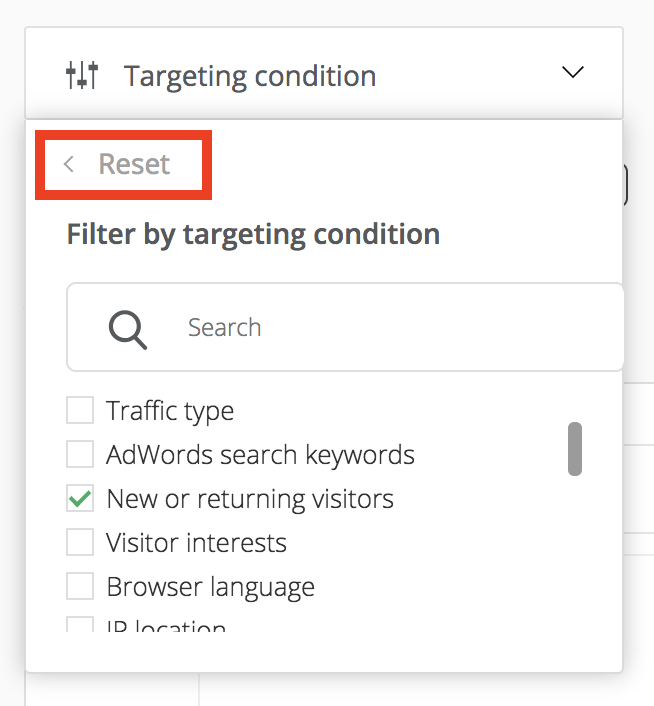 If you want to edit this item and select another audience, click on “Filter audience” at the top of the page and apply one of the proposed filters: the table is automatically updated. A search bar is available if you want to select an existing segment. The number of visitors to this segment and its difference with the selected audience and the overall percentage audience. The evolution of visitors on this segment between the selected period and the same previous period (P-1). The conversion rate is equal to the number of converted visits from this segment to the selected audience. The evolution of the conversion rate on this segment between the selected period and the same previous period (P-1). The gain generated in euros on this segment and the percentage that it represents on the total gain of the selected audience. The evolution of the gain generated on this segment between the selected period and the same previous period (P-1). The average basket of this segment in euros over the selected period and its difference in percentage with the average basket of the selected audience. The evolution of the average basket on this segment between the selected period and the same previous period (P-1). The difference between the conversion on this segment and the overall conversion. 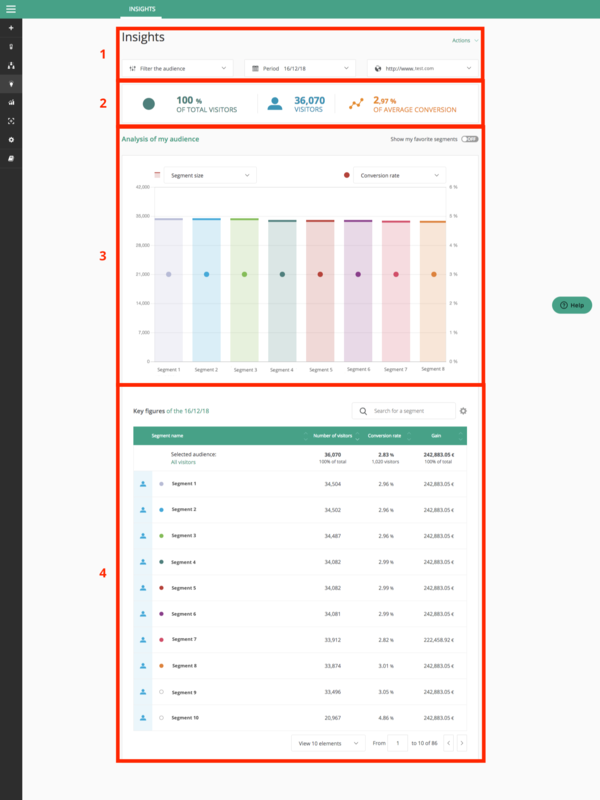 To further personalize your Insights page and identify the segments you are interested in, you can change the view of the audience segmentation table by clicking on the icon: . A pop-in opens. Rearrange the columns by selecting and dragging them, change the data to display, add new ones, or delete some. Do not forget to validate to apply these changes to the board! At the head of the table, click to the right of a column heading to rank segments from largest to smallest (bottom arrow) or smallest to largest (top arrow) based on the data in that column. For example, if you click on the lower arrow of the “Gain” column, the segments will be ranked from the largest gain generated to the smallest gain (regardless of their name, size, conversion rate …). You can compare segments between them according to the criteria that interest you. For example, a segment that has generated a large gain may be ranked 1st if the segments are ordered by decreasing gain and only 5th if the conversion rate is chosen as a ranking criterion. When clicking on a segment of the table, a menu appears. Click “See more details on this segment” to access more specific segment information. To learn more about the “Segments” page, you can read our documentation on the subject. When clicking on a segment of the table, a menu appears. Click on “Add to favorites”: the segment is saved and you can find it later via the icon . When clicking on a segment of the table, a menu appears. Click on “Create Customization” to open the corresponding interface. To learn how to set up personalization, see our documentation on the subject.